The Haywire Custom Shop of South Carolina USA - Haywire Custom Guitars-Highly Recommended! One of the main functions of a Custom Guitar Shop should be to hit the target the first time by building as close to a perfect instrument as possible! At Haywire our aim is getting better every day! The job is only complete when you are completely happy with your guitar because you’ll use it every day. Your guitar needs to be comfortable and light-weight enough to play for hours at a time in any situation without fatigue. The sound has to be clear and tone-great. It has to be built to withstand the rigors of being on the road whether touring or playing in local venues. It has to feel good to you when you play it. The action and feel need to be consistent all the way down the neck so you won’t be forced to alter your playing technique as you travel around on the fret board. A guitar players instrument needs to be in tune on every fret. Looking good works too. We pay careful attention to the intonation settings. It has to look good for you and represent your sense of style. The finish has to last for a long time to protect the wood from absorbing moisture from the atmosphere as well as sweat from direct contact with hard working hands. The neck needs to have a truss rod that is easy to adjust for seasonal variations in temperature as well as the ability to transmit sound and add extra sustain for players. Strings added need to be a comfortable gauge without too much resistance thus making it easier to push down to the crown of the frets. That question always puzzles us. Why? Because our job as a Custom Guitar Shop is to simply make every guitar we sell play exactly how the player who buys it wants it to play! We are the experts, and can make any neck modifications, electronics changes, or custom changes that you like. Unfortunately, most guitar players are so accustomed to traveling from store to store looking for the right instrument rather than making the decision to create their perfect instrument at a custom guitar shop. A custom guitar facility is a smarter way to get what you need. We can take all of the attributes of all your favorite guitars and combine them into the guitar you’ve always dreamed of having. If you like a Gibson style neck, but prefer Custom Single Cutaway electronics, only with active pickups, and would rather have a Double Cutaway style body … it’s not a problem! 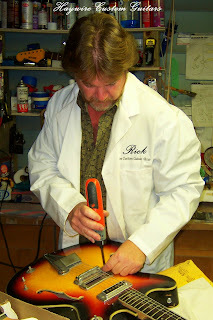 We build, modify, repair, setup, level, straighten and balance guitars. In conclusion, we laser focus a guitar you like and how you want to play it! Before a guitar leaves our shop, it undergoes action adjustments, intonation checks and proper string adjustments to make sure that you have a great playing guitar that plays EXACTLY how you need it to play as a guitarist.